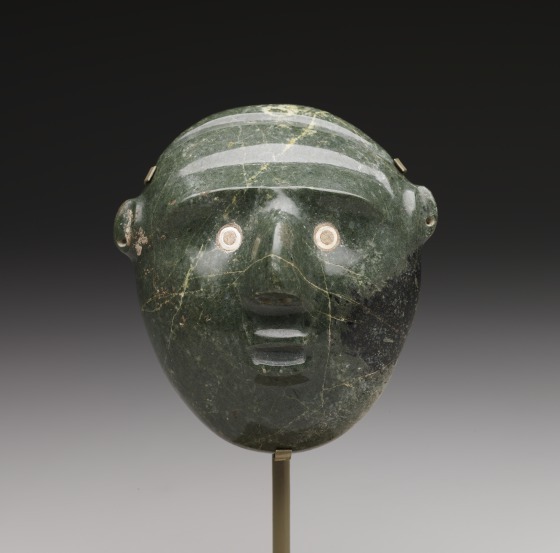 Masks with human features are a common sculptural theme among the various cultures of Mesoamerica and both Central and West Mexico. Early Preclassic (Early Formative) clay masks from Guerrero in Central Mexico indicate the antiquity of the concept. 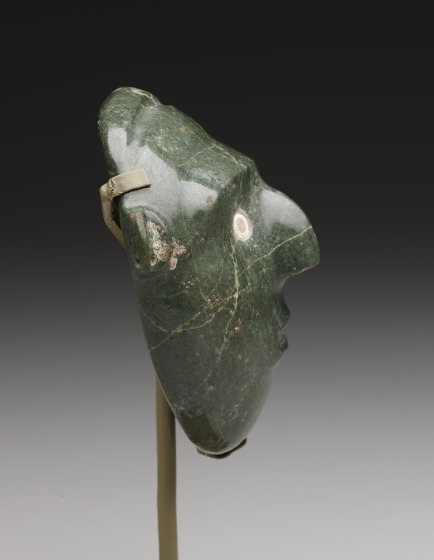 Most stone masks that portray human beings originate from the Mexican states of Guerrero, Chiapas, and Puebla, as well as Guatemala and Honduras. 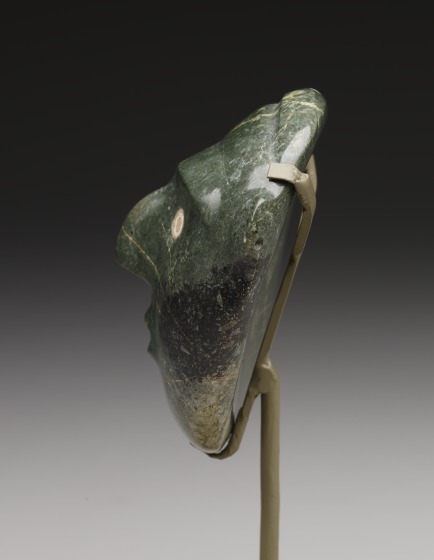 Lapidary artists favored a variety of precious materials for their small-scale sculptures, including alabaster, obsidian, jade, serpentine, and other varieties of greenstone. 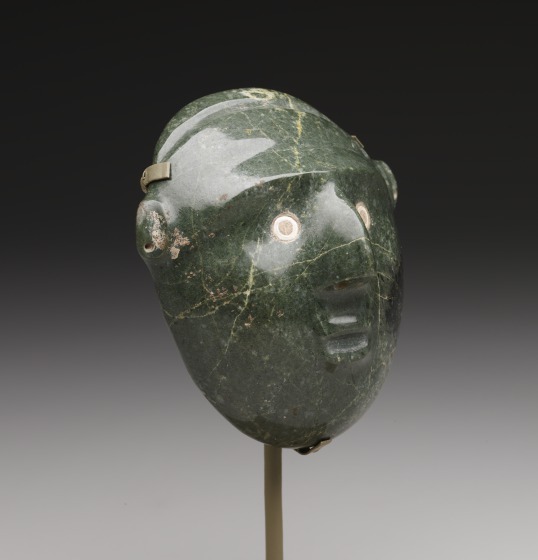 This mask is a fine example of jadeite carving from Late Preclassic (Late Formative) Colima. 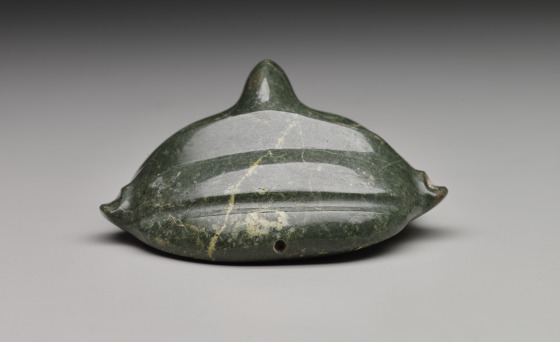 This region is known for a wide variety of sculptural styles from multiple cultural groups that inhabited this area of Western Mexico, though it is best known for its distinctive ceramics. 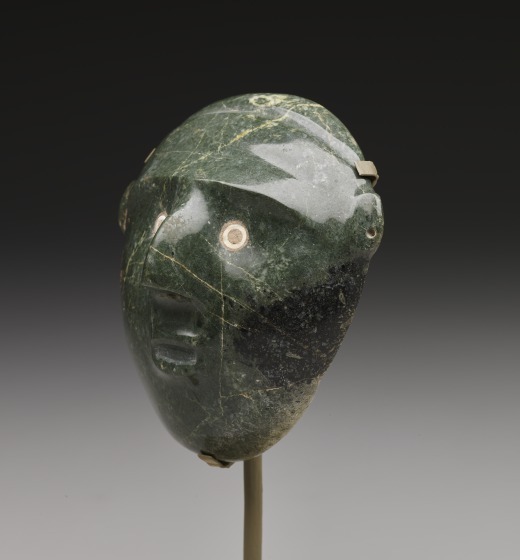 It is believed that many of these small-scale masks were included among funerary goods of the elite, possibly tied to other effigies or the deceased themselves. 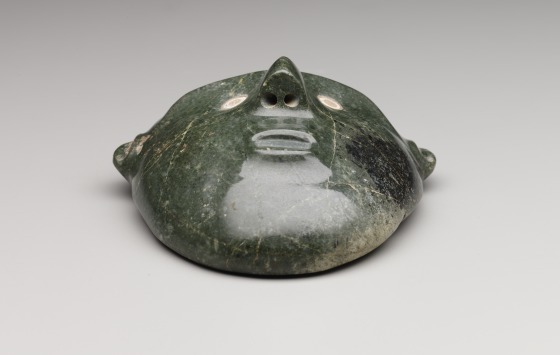 This mask features a prominent brow, shell inlaid in the eyes, and a large nose that dominates the profile, but appears properly proportioned in frontal view. Many masks have suspension holes, either at the top or the sides as seen here, or a combination of both. Western cultures tend to think of masks as obscuring the face. 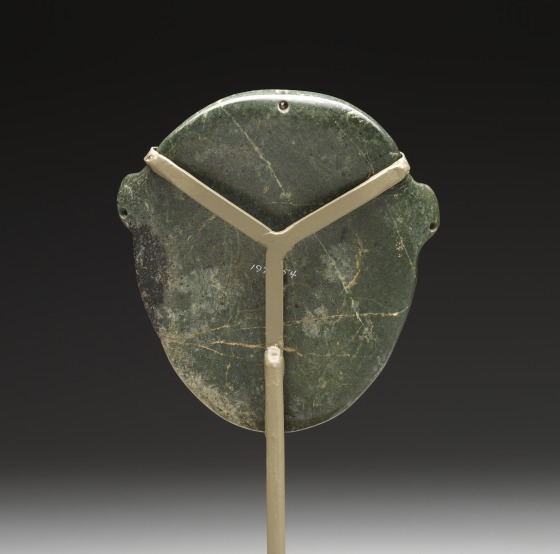 But for many ancient American peoples, masks have always revealed the true inner being of an individual. Masks worn by living people often showed their supernatural forms, while masks worn by deceased rulers preserved for eternity their human form. Elaine Higgins Smith, Digital Collections Content Coordinator, 2016. Peter David (P.D.) 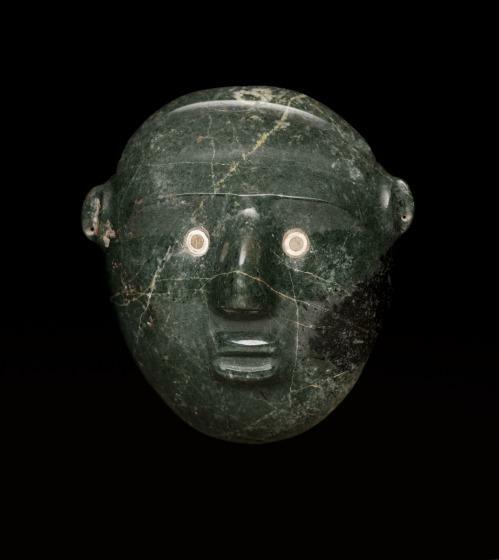 Joralemon, "Human Mask," in Olmec Art of Ancient Mexico, ed. Elizabeth P. Benson and Beatriz de la Fuente (Washington, D.C.: National Gallery of Art, Harry N. Abrams, Inc., and Consejo Nacional para la Cultura y las Artes, 1996), 239.